For my day job, I have the whimsical title “Happiness Gardener.” Honestly I don’t love the title. When asked to provide my title for paperwork, I tend to just say “developer” since that’s the sort of work I tend to do, though you wouldn’t know it from my title. I work on the support team, providing debugging and tool support for colleagues who interact directly with the people who use my company’s products. These colleagues are called Happiness Engineers, a title that is still whimsical but from which does make a certain sense once you connect it to the role these colleagues fill. Getting from “developer” to “Happiness Gardener” takes a little more squinting, I think. So, the Happiness Engineer position existed before the Happiness Gardener position. Back when there were a dozen or so (maybe even fewer) Happiness Engineers (HE for short) at the company, a developer was hired to fill the sort of role I now fill. The idea was that he would sort of clear out weeds by fixing things that affected HEs and customers, while also cultivating improvements that’d help HEs flourish in their roles, and so the Gardener title was born. I was later hired as the second Gardener. The original Gardener has moved to a different team after about 5 years in the role, and now I lead a team that has grown to 7 members. Happiness started out as just a few people working together on one team, but over the years, sub-teams focusing on specific products or on specific types of support have formed, and now we’re around 100 people. Some teams have come and gone, or been renamed, and people have floated from one team to another. Over the years, a few in-jokes have popped up as well. Employees at my company work remotely, from coffee shops, airplanes, their homes, and pretty much anywhere they fancy working from at which power and wifi are available. Once a year, we all get together for a big meetup. In preparation for this year’s meetup, some colleagues designed and ordered a bunch of patches for people who have worked in the Happiness organization. The patches are something like 1.5 inches in diameter, and each of the various teams and represented in-jokes have a patch. I knew about this project a few months in advance of the meetup and was uncharacteristically excited to get my hands on the patches. I’ve got a backpack embroidered with the WordPress logo (a perk of working for the company I work for), and I’m eager to get these patches stitched to the backpack. 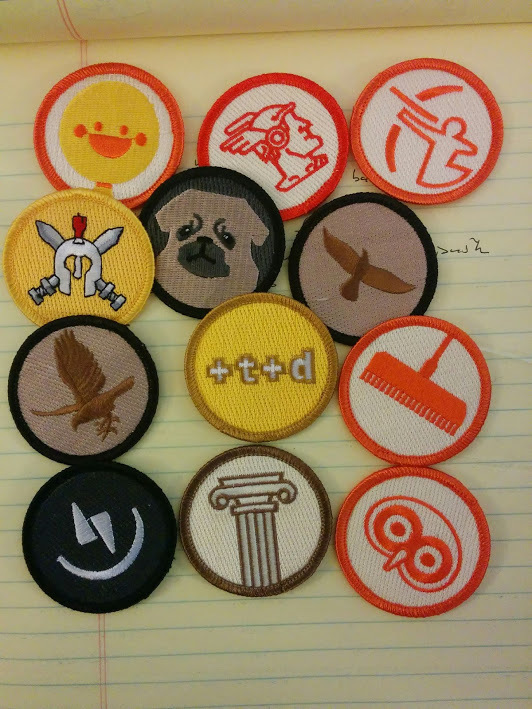 Because my work tends to touch a lot of the Happiness subteams, I was deemed eligible for a bunch of the patches. Now I just have to find a way to get all of them stitched onto my backpack in a pleasing way. 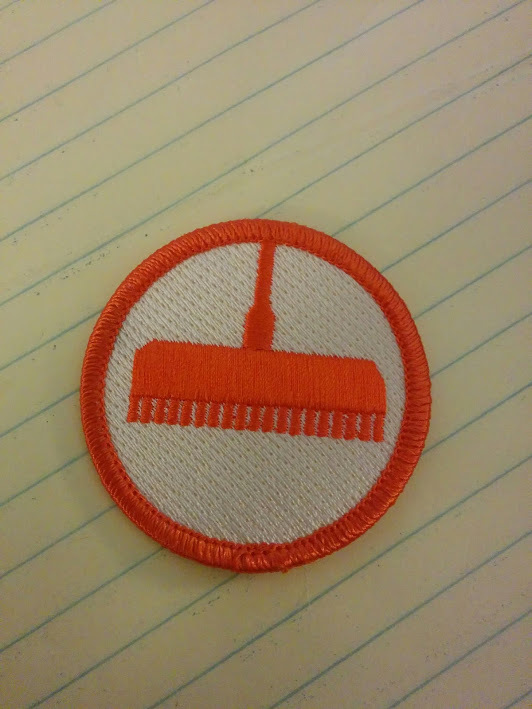 The Happiness Gardener patch is the one that looks like a rake. The origins and meanings of the others I’ll leave to your imagination for now.